SCVHistory.com AL2061 | Mojave Desert | Pacific Coast Borax Company. 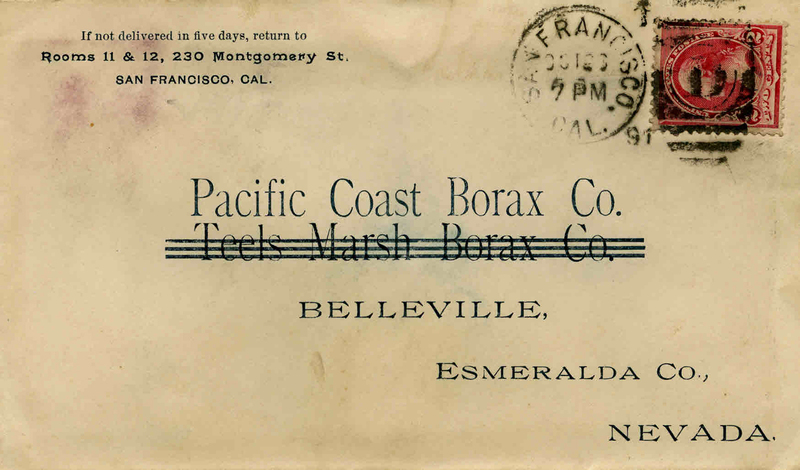 Postal cover addressed to Pacific Coast Borax Company (formerly Teels Marsh Borax Company), Belleville, Esmeralda Co., Nevada. Postmarked San Francisco, Cal., October 23, 1891. Click here for the story of the Pacific Coast Borax Company (later US Borax). Click here for the story of the Sterling Borax Company. AL2061: 9600 dpi jpeg from original postal envelope, collection of Dr. Alan Pollack.